A frail old whisky that can unexpectedly jump into a tap dance! Forty years ago was the beginning of 1973. The Vietnam War continued to rage, Greece was in the twilight of dictatorship and the Sydney Opera House opened. It seems like a very different world, and it was. It was four decades ago. This Black Bull 40 Year Old is the same age as the Sydney Opera House (once it was opened), and as an Australian I find this to be astounding. I am about to taste a whisky that has taken 40 years to develop, and it is an absolute privilege to taste whisky that is over a decade older than I am! 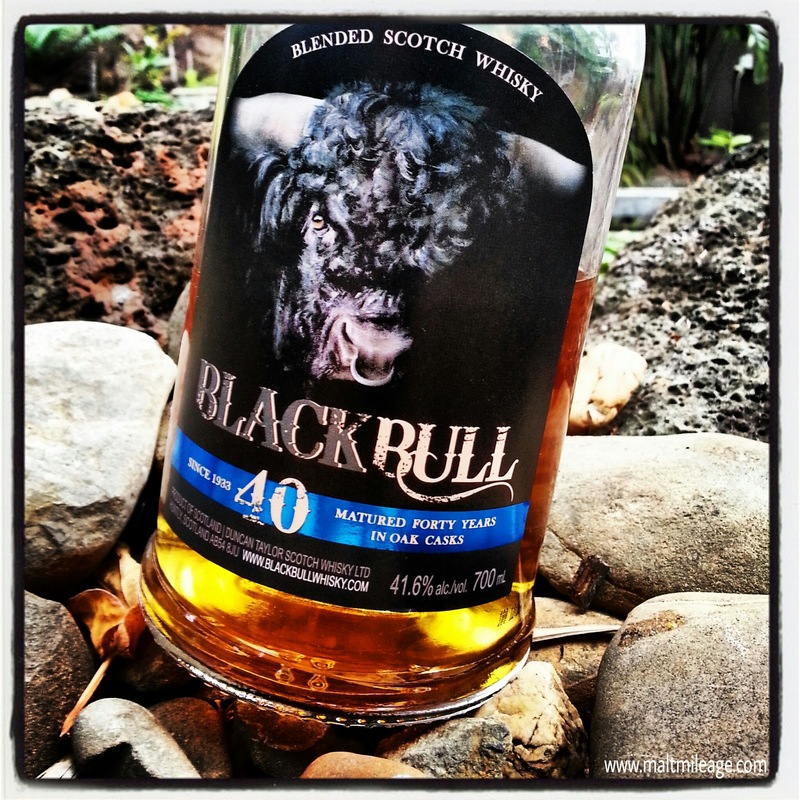 The Black Bull 40 Year Old is a blend, and it consists of 90% malt whiskies and 10% grain. The tube says that 80% of it is from ex-bourbon casks and 20% of it ex-sherry casks which already begins to provide an indication of its flavour. It is bottled at natural cask strength, which after 40 years is 41.6%. It boasts whiskies from distilleries such as Bunnahabhain, Ben Nevis, Highland Park, Caperdonich, Glen Grant, Glenlivet and Intergordon. Quite a mix! This whisky has won a number of awards, and in the World Whisky Awards 2012 was named World’s Best New Release. It is easy to be in awe of this whisky because of its grand old age, 40 years! After cracking open this whisky it may disappoint, but the whisky in my bottle improved after a while and this whisky has become one of my favourites! This whisky is a little on the dry bitter side, but you have bursts of bitter sweetness with some sweet dried fruit shining through as well. Old whisky is very attractive, but it risks being frail and dominated by oak. This occurs because the whisky spends way too much time in the oak barrel than it should. 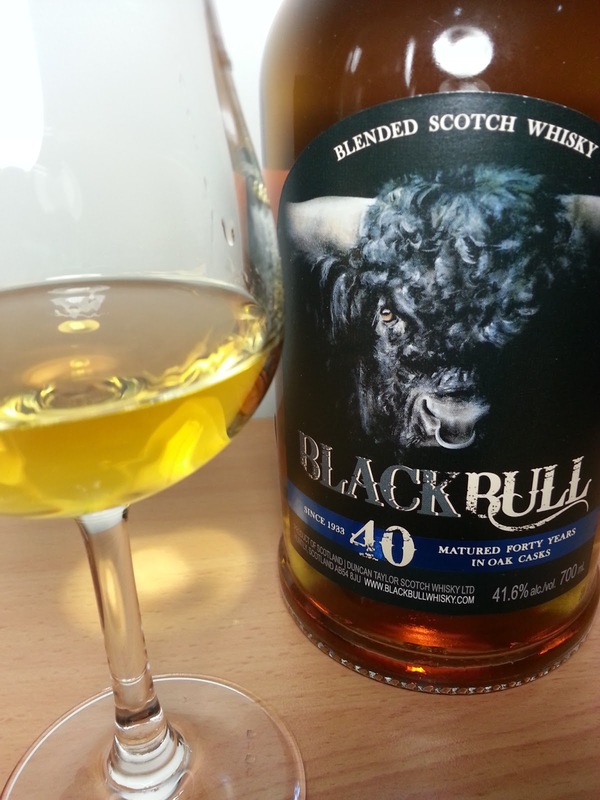 Black Bull 40 Year Old is an old whisky that – somehow – has the some of the spark and vibrancy of a youthful whisky; though it is still soft and mild mannered with an oily texture and character that is not dominated by oak. 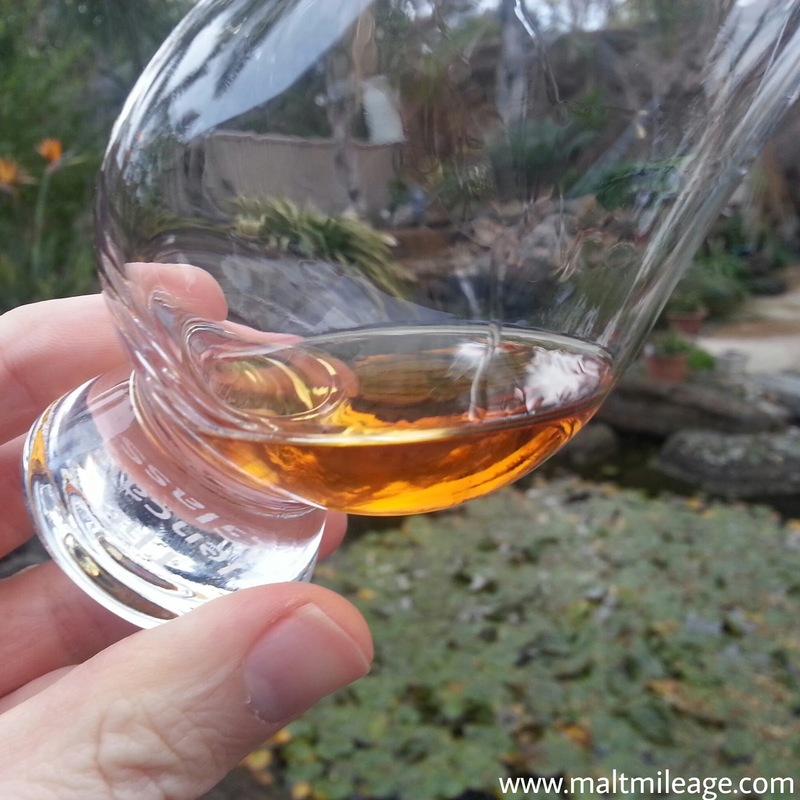 The only negative I could detect in this fine whisky is when putting it context, and blind tasting it alongside Glenrothes 1988 and the Glenlivet 18 Year Old – it seemed to be lacking in clout and was more brittle with a less impressive finish. I have made my way through half the bottle and the Black Bull 40 Year Old is one of the first whiskies that comes to mind when I want to enjoy a dram that is lusciously mature with a youthful streak. Soft and surprisingly fresh for such an old whisky, this whisky gives a floral fragrance that is beautifully balanced with oak and citrus. While this whisky is definitely old, it is also quite energetic bursting with the aroma of blackcurrant and ripe blackberries which cut through the vapour of oak and licorice. With each nosing, and with each visit to this bottle, the experience gets better and better. As the whisky rests in the glass the sweetness of marshmallow develops in a fog of oily sweetness. With a gentle softness this whisky coats my tongue with flavours only 40 years in a cask can produce; the lovely taste of oak and wood combined with a deep butterscotch lingers and is then interrupted by the sharp jab of blackcurrant and blackberry that is quickly balanced against the soft waves of vanilla and old wood that soften the overall delivery of the whisky. The oak is not overpowering at all, but almost perfect as the whisky provides an extremely pleasing explosion of bittersweet berries to provide a spark against the backdrop of wood and aniseed. The fruit transforms on the palate into chocolate coated raisins as the sweet fructose interacts with the oak and the chime of sherry. This whisky has a rich oily texture, a testament to its age! The finish on this whisky is of good quality, because it provides a soft and thoroughly enjoyable kick that then retreats and remains for some time. The oily texture of this whisky ensures that the tongue is coated, providing a long lasting finish. The finish on this whisky was gentle and long lasting; with a dry smoky oak finish with hints of cocoa. This whisky offers a distinct flavour that only 40 long years in a cask can produce. Such an experience is incredibly valuable.